A 34-year-old sociologist presented for evaluation of forehead lesions, which have been present for about 2 years. These began about a year after her daughter’s birth. Before that, she was on oral contraceptives and was fine, but she has not been on any hormonal birth control since then. She saw another dermatologist and was treated with topicals, a SilkPeel, Tretinoin. She also took doxycycline for 2 – 4 weeks. Nothing helped. She is anxious about her appearance. O/E: The examination shows a pleasant, outgoing woman. 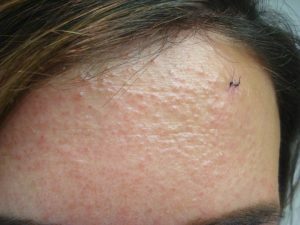 She has a somewhat pebbly appearance to the forehead with many, mostly not inflammatory discrete and confluent submillimeter papules. There were a few erythematous papules. Initial Diagnosis: I considered an acneiform eruption. A 4 mm punch biopsy was performed. Pathology: Thanks to Assistant Professor Hye Jin Chung, MD from Boston University Skin Pathology for kindly providing these beautiful photomicrographs. 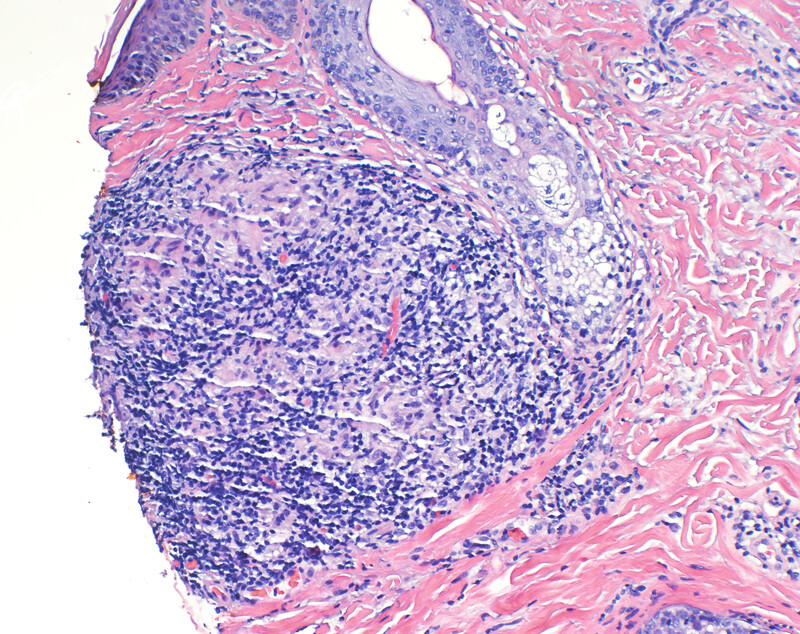 There is a moderate and superficial perivascular and perifollicular infiltrate. 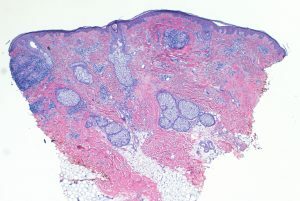 Focal granulomas formation is noted. Discussion: Is this really a subset of rosacea, or is it an acneiform disease sui generis? Clinically, it does not look like rosacea and it appears to be defined by dermatopathologists who only see small plugs of skin. Similarly, perioral dermatitis is an acneiform disorder of uncertain etiology, but the diagnosis is strictly clinical. Demodex rosacea is easier to diagnose clinically than granulomatous rosacea. Lee GL, Zirwas MJ. 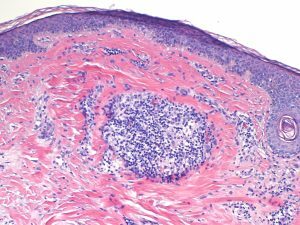 Granulomatous Rosacea and Periorificial Dermatitis: Controversies and Review of Management and Treatment. Dermatol Clin. 2015 Jul;33(3):447-55. Abstract: Granulomatous rosacea and periorificial dermatitis are common skin conditions affecting the face. This article examines the historical origin, causes, clinical presentation, and management strategies for these entities.2. Omar Khokhar and Amor Khachemoune. 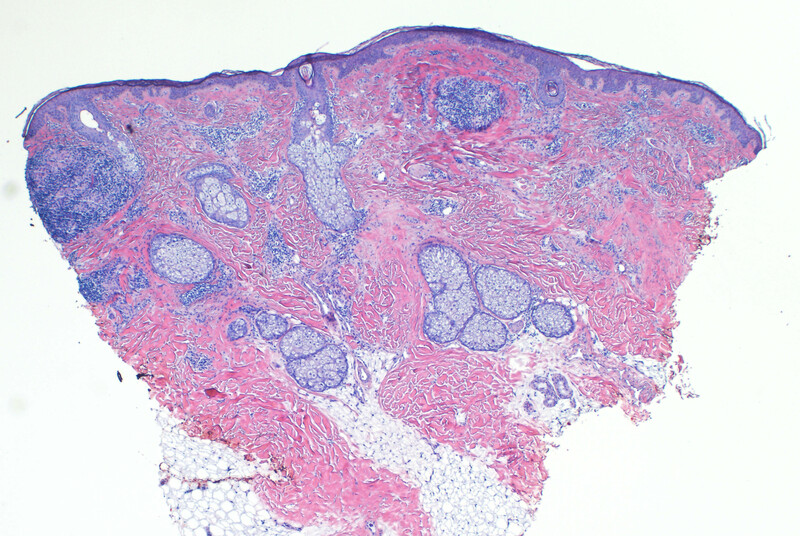 A Case of granulomatous rosacea: Sorting granulomatous rosacea from other granulomatous diseases that affects the face. Dermatology Online Journal 2004 10 (1): 6 Free Full Text. Abstract: Granulomatous rosacea is a variant of rosacea that may present similar to other granulomatous diseases. We present the case of a 45-year-old woman with a 2-year history of facial erythema with multiple papules and pustules on the cheeks, chin, and glabella. The patient responded to minocycline, resulting in healing 6 months without residual scarring. This patient’s clinical and histological presentation and treatment outcome are to our assessment consistent with granulomatous rosacea. However, other clinically and histologically related entities will be discussed. These entities include, but are not limited to, perioral dermatitis, granulomatous periorificial dermatitis, lupus miliaris disseminatus faciei, facial afro-caribbean eruption syndrome, and sarcoidosis. 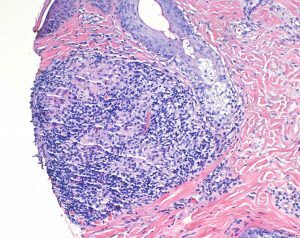 This entry was posted in Elpern, David J. and tagged granulomatous rosacea, Hot Spots 2018 by humanemedicine. Bookmark the permalink.